National Guidelines created through a partnership between the National Wildlife Federation and the Natural Learning Initiative to bring nature play and learning to every community. For those who create, manage, or promote the development of nature in the everyday environments of children, youth, and families, especially in urban/suburban communities. 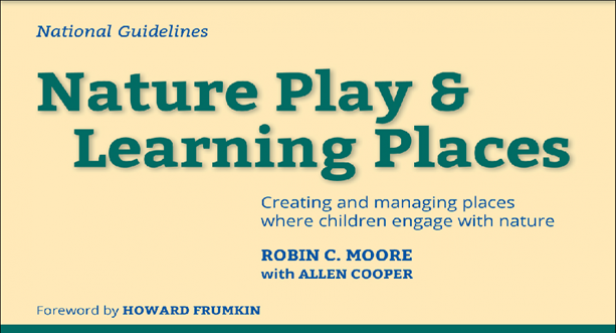 from the Foreward to Nature Play and Learning Places by Howard Frumkin, M.D., Dr.P.H., Dean, University of Washington School of Public Health. Current Status: We apologize that Nature Play and Learning Places is currently unavailable. The initial print run rapidly sold out. Publication as a print book is currently under review. We hope to have an updated publication date soon. Please send an email to naturalearning@ncsu.edu, so we can update you on the progress. Thanks again for your interest.